Avant e5 - Reach It! - Move It! - Crush It! Avant e5 Green is the way! 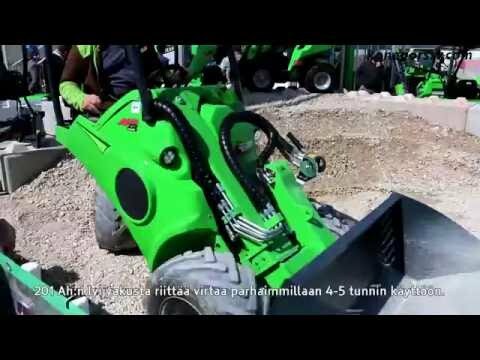 Avant e5 is a full electric battery powered articulated loader. It enables the use of a loader in a space that does not allow any emissions or where operations have noise restrictions etc. Avant e5 can use standard Avant attachments and it has auxiliary hydraulic outlet on front with 30 l/min flow. Especially suitable for indoor use where ventilation is limited or non-existent and there are strict noise restrictions. Avant loaders and attachments have been designed for year-round use. Cab options, work light options and technical solutions in the loaders have been made as well to the winter cold as to the summer afternoon. Avant’s features are therefore very versatile for year-round use. Wide range of attachments will ensure that the machine is not standing without use a large part of the year but that there will be lots of beneficial uses each time of the year. Light machine combined with articulation enables driving on sensitive ground without harming it. This saves a lot of time because you won’t have to repair damages after your work is done. It also enables use of the loader as an effective lawn mover. Operating and maintenance costs of the battery powered e series with electric motors are extremely low. There are no fuel costs, and the electric motors don’t need maintenance or changing of filters/oils. Thanks to the integrated battery charger you can charge the batteries anywhere a 230V/16A power outlet is available. Due to the articulated steering also the wearing out of tires is minimal in normal conditions. Articulated loaders of Avant are very easy to learn to drive. The loader is controlled from the steering wheel and driving forward and backwards happens with two pedals. The machine’s compact dimensions facilitate driving, because driver can see the whole machine and attachment while sitting on the driver’s seat. Even if you don’t have any previous experience with driving machines, you can learn to drive Avant with just few hours of practise. Third important fact with visibility is Avant’s eccentric telescopic boom. Telescopic boom is located aside from the central line of the machine and due to this the visibility to the front is very good in every position of the boom. Stepless hydrostatic drive of the e series ensures a pleasurable driving experience. Thanks to the hydraulically pilot operated variable displacement drive pump the loader is easy to drive and there are hardly any consumable parts. Maintenance includes mainly greasing of parts, and for example there’s only one filter: return filter in the hydraulic system. On the whole, the e series loader is a comfortable partner as well with the driving as with the maintenance. Versatility and comfort of the machine are increased by the wide selection of options.